The Sugar Land Democrats Club is a club of Democratic activists in Sugar Land, Texas and vicinity dedicated to educating, improving, and uniting our community. Click here $$$ to make a secure online DONATION through our partner, ActBlue, the online clearinghouse for Democratic action. For more information, please see the About Us area of this site. Then, the Tea Party zealots took governorships, state legislatures and Congress in the 2010 midterm election and began to execute an agenda that weakened the labor movement, stifled women’s rights, and disenfranchised voters everywhere. Never again! The 2014 mid-term elections must mark the return of a Democratic majority in the US House of Representatives and the election of Progressives at every level of government. To that end, the Fort Bend County Democratic Party is hosting its 2013 Winter Retreat. We plan to bring together political activists, like you, who have been on the front lines fighting to re-elect President Barack Obama and other candidates who reflect our core Democratic values. We have a diverse and impressive group of caucus speakers who will share their best practices on how to build coalitions, organize communities, expand our base and winelections. Our goal is to learn from the best and begin implementing strategies that will truly transform the political landscape of Fort Bend. We need you. Speaker: Dr. Harold Recinos, Professor of Church and Society, Perkins School of Theology, SMU Dallas, TX. Recently he edited Wading Through Many Voices: Toward a Theology of Public Conversation, 2011. Recently awarded the Palmer Theological Seminary 2011 Orlando Costas Award in Preaching Ministry for his lecture on "Christ Among Strangers" a theological and evidence-based critique of the immigration restrictionist/nativist movement, and its consequences regarding intercultural/multiracial relationships. Regressivity: Last year the Sugar Land Tea Party brought the number one anti-Muslim bigot Pamela Geller to speak to our community to divide us. Progressivity: The Sugar Land Democrats Club brings to you a Christian Theologian to speak about Faith and Politics and discover ways to unite us...and we will hold this event at the Vietnamese Buddhist Center so that we can get to know our neighbors better. Sugar Land residents and leaders of the Sugar Land Democrats Club were elected to represent the state of Texas as national delegates to the Democratic National Convention in Charlotte, N.C. September 4-7, 2012. District 17 delegates. He is precinct chair of 4029 representing Sugar Mill, The Hill, and Lakeview.Patterson is a sales development manager for PPG Industries Flat Glass Division responsible for Mexico, Texas, and Louisiana. 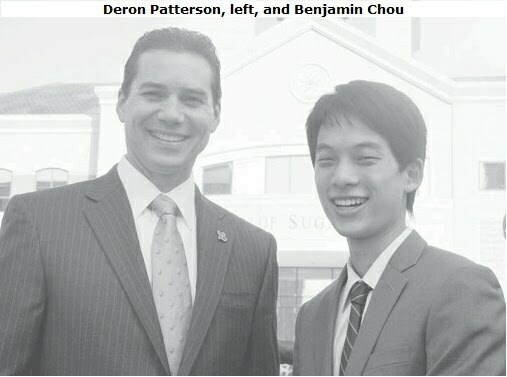 Benjamin Chou, Asian-American Outreach Director of the Sugar Land Democrats Club was elected by Senate District 18 delegates. He is precinct chair of 4135 representing Telfair Subdivision. He is a senior at Rice University majoring in political science, Asian studies, and energy policy. For his political work and environmental leadership at Rice, he has been nationally recognized as a Harry S. Truman Scholar.A son of Chinese immigrants, Ben spent the fall of 2011 studying abroad in China. In addition to Deron and Ben of Sugar Land nine more Fort Bend County residents were elected to represent the state of Texas at the Democratic National Convention. They are Susan Bankston, Don Bankston, Rene Brown, Trisha Frederick, Doretha Gill, George Gill, Kate Mitchell, Akayla Pomare, and Fort Bend County Democratic Party Chairperson Steve Brown. On Saturday, July 21st, from 10:30 a.m. to 12 p.m. the Sugar Land Democrats Club will hold their monthly meeting at the Sugar Land Branch Library located at 550 Eldridge Road.